This Sunday, Donald Trump is still leaping ahead, and nothing he says seems to slow him down. Will 2016 be the year the political establishment of both parties gets toppled? I’ll be joined by Bernie Sanders, another outsider who has upset the old political order. Also, the commander-in-chief test. With America facing challenges on a scale not seen since 9/11, which candidate is best qualified to keep us safe at home and abroad? Why are we okay that 88 Americans die every day due to gun violence? Why are we okay with that? Joining me this morning for insight and analysis are Matt Bai of Yahoo! News, Helene Cooper of the New York Times, Amy Walter of the Cook Political Report and Michael Gerson of the Washington Post. Welcome to Sunday, it’s Meet the Press. And good Sunday morning. I'm Andrea Mitchell in for Chuck Todd who is taking a well deserved holiday break. Twelve months ago most political pundits would have laughed in your face if you suggested that by the end of the year Donald Trump would have a commanding lead in the race for the Republican nomination. And Bernie Sanders would be giving Hillary Clinton a run for her money on the Democratic side. But 2015 has been a year when conventional wisdom was turned on its head. The big question for 2016 is whether the old order can reassert itself. In a moment, I'll be joined by Bernie Sanders, but this Christmas week there wasn't any peace and goodwill from Trump as he used a vulgar term to refer to Hillary Clinton's 2008 defeat to Barack Obama, and criticized her for taking a bathroom break during last weekend's Democratic debate. She got schlonged. I know where she went. It's disgusting. I don't want to talk about it. Clinton hit back, accusing Trump of using degrading and sexist language. Nothing really surprises me anymore. I don't know that he has any boundaries at all. And his bigotry, his bluster, his bullying have become his campaign. My next guest, Bernie Sanders, responded with humor. I'm going to honest with you, have got to lay it out on the table. I also went to the bathroom. Sanders has shown surprising strength in the early voting states and in some hypothetical match ups against Trump. But what is his path to the nomination? Senator Sanders joins me now from Burlington, Vermont. Welcome back to Meet the Press, happy holidays senator. Happy holidays to you and to all of your viewers. Thank you very much. Well, let's talk about, first of all, the data breach and the dust up between you and the Democratic party. You fired one staffer. Suspended two others. Has any other action been taken, any update now, on this dispute? Well, we're trying to work with the DNC to put this whole thing behind us. There were two breaches. We screwed up on one and the other one we did the right thing. Right now we're in negotiations with the DNC. Frankly, Andrea, I think for the American people there are far more important issues having to do with the disappearance of the American middle class and huge income and wealth inequality and climate change and the corrupt campaign finance system. So I think on both sides we'd like to focus on the real issues. Well, while you're trying to, as you point out, focus on the real issues, there have been charges of sexism back and forth between Donald Trump and Hillary Clinton. He used a vulgar term against her and then said it wasn't really that vulgar. Then she said said that she's going to have Bill Clinton campaigning in January and he tweeted out in the last 24 hours, "Hillary Clinton has announced she is letting her husband up to campaign, but he's demonstrated a penchant for sexism. So inappropriate." Are we getting into an argument not only of sexism between Donald Trump and Hillary Clinton, but Donald Trump attacking Bill Clinton? Well, I tell you what. We're going to let my wife Jane out and I think Hillary is going to be in real, real trouble. But look, the real issues are not Donald Trump's vulgarity. And he is vulgar. It is the fact that Donald Trump thinks we should not be raising the minimum wage. He believes that wages in America are too high. This guy wants to give hundreds of billions of dollars in tax breaks to the top 3/10 of 1%, and meanwhile what he wants to do is divide our country between Latinos and Americans and Muslims and everybody else. That's not the kind of America we need. Andrea, what we have got to do is ask the hard questions. And that is why is it that the people on top are doing phenomenally well while almost everybody else is seeing a decline in their real incomes? Why is it that we're not effectively addressing the fact that climate change is absolutely real. I am in Burlington, Vermont right now. Nobody can recall a Christmas Eve the likes of which we have seen where the temperature was 65°. And what the scientists are telling us, if we don't get our act together we're going to be leaving a planet to our kids and grandchildren which is not going to be in good shape. And yet Donald Trump, among others, denies even the reality of climate change, let alone doing something about it. So we've got some really important issues to discuss in this campaign. And I intend to do just that. --heavy on foreign policy. Let me just finish. Doesn't it show that you still, among people who are concerned about foreign policy, concerned about terror, you really have some ground to make up against Hillary Clinton. It's interesting the way CNN spun that poll, because you know what that poll showed? It showed between their last poll and this current poll we gained 12 points on Hillary Clinton. She dropped eight. We went up by four. That is the message of the poll. Another poll came out, Rasmussen, also showing us closing the gap. In New Hampshire some of the recent polls have us ahead and in Iowa, we're close to catching up to her. So I think what the polls are showing is that the American people are responding to our message. Now, in terms of ISIS and in terms of foreign policy, these are of course huge issues. The American people are concerned about another terrorist attack, and what I have said over and over again, we must destroy ISIS but we must do it in a way that is smart. At the same time, the polling has shown that on foreign policy and on ISIS that you are far, far behind Hillary Clinton. And you have said that you would somehow persuade the Saudis to stop fighting in Yemen and turn their attention to ISIS. No one else has been able to get that, to persuade the Saudis to do that. How could you, as commander-in-chief, do what other presidents have failed to do in terms of getting the Saudis to listen to what America wants for the fight against these terror groups? Well, what has got to happen, and certainly the United States and the other major powers have a great deal of leverage, A, it cannot be the United States alone. B, what many people in the Middle East understand, it must be the Muslims themselves on the ground destroying ISIS. So what we need is in fact a coalition. Saudi Arabia, Qatar are incredibly wealthy countries and they have got to start using some of their resources to help us destroy ISIS, rather than, in the case of Saudi Arabia, fighting in Yemen. In the case of Qatar, spending hundreds of billions of dollars in preparation for the World Cup in 2022. So what I think American leadership is about is putting together that international coalition to destroy ISIS. But let me also say this, Andrea. I know sometimes the media thinks that is the only issue. It is an enormously important issue. We have got to defend America. We have got to destroy ISIS. But right now are people watching this program who are 55, 60 years of age. They have zero dollars in their retirement account. They're wondering how they're going to make it in their older age, which is why we have to expand Social Security. There are millions of young people out there desperately want to go to college. Don't want to leave college deeply in debt. We have got to deal with that issue. We're the only major country on Earth that doesn't provide paid family and medical leave. Doesn't provide healthcare for all people as a right. We cannot ignore those issues. So my view is yes, of course, we've got to focus on foreign policy. We have to destroy ISIS. But I will not stop fighting for working families and the middle class, will not stop taking on a billionaire class whose greed, in many ways, is destroying our economy. Now, as you head into these early voting states you have to win New Hampshire, your neighboring state. You're ahead in most polls there. Do you feel that the Democratic party, led by Debbie Wasserman Schultz, is trying to sabotage your campaign and not being an impartial arbiter going into these early fights? Well, as you've indicated, there's no question but that both Iowa and New Hampshire are enormously important for me or for any other candidate. When I began this campaign, Andrea, we were nationally at three, four percent in the polls. We were way, way behind in Iowa. Way, way behind in New Hampshire. In New Hampshire I think we may be a little bit ahead. In Iowa we're closing the gap. So in my view we've got a real shot to win Iowa. We've got a real shot to win New Hampshire. I am going to spending a lot of time in the next four or five weeks in Iowa, in New Hampshire. We have a wonderful grassroots organization. A lot of volunteers who are knocking on doors. And if we can win in Iowa or New Hampshire I think it really does open us up to a path toward victory. Is the DNC giving you a fair shot? Look, we have had our differences of opinions with the DNC, but at the end of the day the DNC, Hillary Clinton and myself, we want to defeat right wing extremism in this country. So we're trying to work out our differences of opinions. Well, Senator, thank you very much and a happy holiday to you and your family. Safe travels. And I'm joined now by Florida Congresswoman Debbie Wasserman Schultz, chair of the Democratic National Committee. Welcome. Happy holidays to you. Thank you Andrea, and to you as well. Well, first of all, what about Donald Trump and this new attack that he has unleashed on Twitter against Bill Clinton campaigning for Hillary Clinton more actively in January? My assessment of Donald Trump's candidacy is that he's been an equal opportunity insulter. He has engaged in some of the most vulgar invective and rhetoric and really brought this presidential campaign, its tone and where the debate is on the other side of the aisle, to the lowest steps I've ever seen in a presidential campaign. So much so that my own daughters, when seeing his commentary on TV, ask me, "Mom, why is he so rude?" That's not what we should strive for in holding up presidential candidates on either side of the aisle. We're supposed to want our children to emulate at least the leadership and values, even if you don't agree with them, of our presidential candidates. And unfortunately what's going on on the other side of the aisle has taken this to a new low in presidential politics. Does it raise questions as to whether there is some risk involved in unleashing Bill Clinton, as popular a figure as he is in the Democratic party. He had his problems in 2008. We saw what happened in that campaign. But Donald Trump is going to raise this issue, as he is warning, of Bill Clinton's past and sexism. Does that give you any pause as Democratic chair? I think that Donald Trump or any candidate on the other side of the aisle would raise Bill Clinton as somehow a negative to their peril. I think every poll I've ever seen shows that if President Clinton were a candidate tomorrow he'd be reelected. He presided at that time over the longest period of sustained prosperity up to that point. Finished his term very popular and continues to be one of the most admired elected officials, and former elected officials, and men in the world. What about sexism in this campaign? Donald Trump claims that he was not using a vulgar term when he said that Clinton had been schlonged by Barack Obama in her defeat in 2008. But more to the point of the sexism that has been alleged, the bullying by Hillary Clinton against Donald Trump, because I think he is in a class by himself as far as the way he has responded. He certainly has taken this to a new low. This is partly what he had to say about Hillary Clinton's campaign energy. She does an event. She puts on her pantsuit. (LAUGHTER) She walks in. No. it’s true. She walks in, does an event, you don't see her for four days, five days. You know why? She goes back home and she goes to sleep. This is not what we need as a president. We need tremendous energy. Now, this low energy criticism worked against Jeb Bush. It really hurt Jeb Bush. Is it going to work against Hillary Clinton? Like I said, Donald Trump has been an equal opportunity insulter. He's insulted and been vulgar about not only Secretary Clinton but Carly Fiorina, Megyn Kelly, even me. It's really outrageous the depths and how low he has allowed the campaign to sink. And the rest of the Republican field, Andrea, is going along with it. Why is it working so well for him? In head to head hypotheticals he's doing so well against Hillary Clinton. It's very simple. Why he's doing so well in the Republican field is because this is where the Republican party of today is. They embrace defunding Planned Parenthood. They don't believe in equal pay for equal work. They don't believe that we should make sure that women have an opportunity to make their own healthcare choices. This is not where Americans are today. Americans are where the Democratic party is. Where Hillary Clinton and Bernie Sanders and Martin O'Malley are, wanting to continue the economic prosperity that we've been able to create, bringing us from the worst economic crisis since the Great Depression forward through 69 straight months of job growth. And that's where we're going to continue, because we'll elect one of those three candidates as the 45th president of the United States. We're going to have to leave it there, but thank you very much our Democratic party chair. And after the break, sexism, Islamaphobia. Why has the tone of this campaign been so angry, including against the press? I would never kill them. But I do hate them. And welcome back. Lots of politics to discuss with the panel. Matt Bai, national political columnist for Yahoo! News. Helene Cooper, Pentagon correspondent for The New York Times. Amy Walter, editor of The Cook Political Report and Michael Gerson, a former chief speechwriter for president George W. Bush and Washington Post columnist now. Welcome all. Well, Amy Walter, first to you. Clearly a truce between Bernie Sanders and Debbie Wassserman Schultz on that. But what about Donald Trump going after Hillary Clinton, going after Bill Clinton. Does this work for him? Well, it has thus far. Look, I think Donald Trump has done something unique in this campaign which is he has understood the Republican electorate better than any other of the Republican candidates going in there and he's understood the media environment in which he can make these pronouncements. The problem for Donald Trump, though, is for as well as he is doing currently on the Republican side he continues to make himself less electable in general election. You look at where his negatives are, they're higher than Hillary Clinton's. If you look at the match ups between Donald Trump and Hillary Clinton in a general election, he's the only Republican candidate losing to Hillary Clinton, in some cases by more than 10 points. So for as much as this is getting him all the attention that he loves and adores and his getting him the crowds of Republicans, it is pushing him further and further away from the possibility of actually winning a general election. At the same time, Matt Bai, she has had difficulty energizing younger women. Millennials. Is this attack by Donald Trump going to help her energize the women's support that she really needs? It could. I mean Hillary Clinton might be having the luckiest year of any nominee in recent memory. She's had Bernie Sanders, who is going to wage a real fight in those early states, but I think if you had told her early on he was going to be her only serious opponent at this time in the race she'd have been pretty happy about that. And then theoretically she could draw Donald Trump or even Ted Cruz, who I think do give her a great platform. So look, she's up against a very difficult historical win, trying to get a third term for her party. She would be the oldest nominee, the oldest president taking office we've seen. But all of that won't matter very much if she's just very lucky in who she draws. And to this point she's looking very lucky. Helene Cooper, we saw Bernie Sanders, even today, not talking about foreign policy. He started our interview talking about climate change, economic disparity. His wheelhouse. Even after the most recent polls show that he really lost ground in that debate last Saturday night when he failed to respond effectively, according to those polls, on foreign policy. That's absolutely true. And I think that he's just not that comfortable there. He doesn't really want to talk about it. You see him, and you see many of the Republican candidates as well when it comes to foreign policy, they repeat the same talking points. And they say that we need a coalition. A lot of the things that they say that we should be doing are things I would add that the administration is already doing. So just watching them, and I felt that way as well with the Republican debate, the last Republican debate, when these guys are talking they're coming out with these phrases that are designed to make them seem as if they're being strong, but when you look behind sort of the rhetoric and there's not much there. When you ask for specifics, as you did, you didn't hear a lot coming back. Well I’ll speak for all of us on this point. Donald Trump certainly made this clear, and he does this at his rallies, to the real discomfort of a lot of the reporters covering it. Let's watch. I would never kill them. I would never do that. Let's see. No. No, I wouldn't. I would never kill them. But I do hate them. Have you ever seen Donald Trump and the Drunk Uncle on Saturday Night Live Weekend Update together? That was a pretty good imitation. But Michael Gerson, to the serious point of the level of invective, I haven't seen this, frankly, since the George Wallace campaign where attacks on the media at rallies really were one of the signature effects. Well, it's important we realize what context this was in. He was praising Vladimir Putin, who is someone who has imprisoned and killed journalists. And this is where we need to make the distinction between the ridiculous and the dangerous. This is a man now flirting with authoritarianism. Praising the leadership style of Vladimir Putin. So is this a rhetoric? He has extreme policies. And now he's praising a leadership style that really flirts with authoritarianism. This is a serious, serious matter. But of course it is working and, Matt Bai, you wrote memorably this week why. That we are somewhat to blame. In fact you wrote, "It's clear now that Trump's enduring popularity is in no small part a reflection of an acid disdain for us. This is a simmering reaction to smugness and shallowness in the media, a parade of glib punditry unmoored to any sense of history or personal experience. It's about our love of gaffes and scandals, real or imagined, and our rigid enforcement of the politically correct." Discuss. Oh, I've heard some discussion. Look, I've made this point. It's not always popular. We treat presidential politics and politics in general like a reality show and we have for years. I mean if you've been following the media in this campaign we set up NCAA brackets to match the seeds in the campaign. We order up every kind of garbage poll you can find. We literally treat our candidates as contestants on a game show to be voted off or vote on. And I think there's a cost for that and the cost is that you set up a platform where someone like a Donald Trump can come and exploit it very handily, because he is the perfect reality show candidate. And I think at this point there is this symbiosis with the media and Trump. I think at this point he has to be covered to the extent that he is because he is clearly leading, late in the campaign in the polls. But there's a long period in this campaign where I think we exaggerated his support because it brought ratings and it brought clicks and it was the great shiny story of the campaign. And I think we did a great disservice to the country. Let's leave that here for a moment. We'll be back. And when we come back the war against ISIS and the major foreign policy challenges facing the next president. Which candidate is best qualified to be commander-in-chief? And welcome back. From Beijing to Baghdad, America is confronting incredible challenges on a scale not seen since the days immediately after 9/11. After the Paris and San Bernardino terror attacks which candidate should be trusted to sit in the Oval Office? It's a big question for voters in 2016. The commander-in-chief test. Which candidate will be able to handle crises around the world and terror threats here at home? In Afghanistan, America's longest war. Just this past week the worst U.S. troop losses in three years. It's still dangerous, as we saw this past week. We had some outstanding brave men and women who were killed. In Iraq, Sunnis and Shiites struggle for power, Syria is in shambles and ISIS is on the march from Iraq and Syria to Libya, Afghanistan and beyond. Who can defeat the terror groups? Donald Trump says let Vladimir Putin do it. If Russia wants to bomb them, let them bomb them. But it's Putin, along with Iran who has kept Syria's brutal dictator, Bashar al-Assad, in power. Russia and Iran have to face the facts that continuing to prop up a vicious dictator will not bring stability. Right now I'm afraid President Putin is actually making things somewhat worse. Unlike Obama, Hillary Clinton has called for a no fly zone over Syria. One of the reasons why I have advocated for a no fly zone is in order to create those safe refuges within Syria. But with Putin now flying air strikes over Syria, even she now acknowledges this is more complicated. Experts warn the U.S. could find itself in a dogfight with Russian fighter jets. Russia's planes are flying combat missions. You have advanced Russian weapons systems. That means our ability to operate is that much less. All of this as the Syrian conflict produces a flood of refugees overwhelming Europe and becoming an explosive campaign issue at home. President Obama and Hillary Clinton's proposal to bring into America tens of thousands of Syrian Muslims is nothing short of lunacy. And now one dissenting Republican voice has been forced to drop out. Donald Trump has done the one single thing you cannot do. Declare war on Islam itself. And I'm joined now from Palo Alto by Michael McFaul, former ambassador to Russia under President Obama, and here in our studio, Wendy Sherman, who recently stepped down as under secretary of political affairs at the State Department. Wendy Sherman, how is this anti-Muslim rhetoric having an impact on our foreign policy and our relationships with allies? It's incredibly dangerous, Andrea. This kind of Islamophobia is really playing right into the recruitment by the jihadis of people from all over the world. It is alienating the very people that we need to be working with us. This has to be led by the Muslim world, this effort to defeat ISIS. The United States is an important partner in that effort, but we cannot do it alone. We should not do it alone. And indeed this kind of rhetoric is only pushing people away from us when we need them the very most. And Mike McFaul, one of the leading rebel leaders in Syria was killed, reportedly by Russian strikes, indicating to some that Vladimir Putin is playing both sides and really disrupting the peace process that would be critical to any successful fight against ISIS, the peace process that was just being launched to try to negotiate an exit strategy for Assad. What role is Vladimir Putin playing with his surprising entry in September into the Middle East crisis and his airstrikes in Syria? Well, let's be clear. The reason why he went into Syria was to support Assad. He made that very clear. He said that to his own people. He has to justify why he did this military intervention. It was to support Assad. And first and foremost, that has meant attacking those that we support. Now, over the last couple of weeks there's been some signs that he might attack ISIS, but as you just reported they are still going after those that we think need to be part of the solution in terms of a political transition. Which raises the point about the wisdom of Donald Trump and what he has had to say, embracing Vladimir Putin. Let me play that for both of you. At least he's a leader, unlike what we have in this country. I've always felt fine about Putin. I think that he's a strong leader and he's a powerful leader. He's represented his country. That's the way the country is being represented. And he's actually got popularity within his country. They respect him as a leader. Mike McFaul, first to you. There's so many things that are wrong with that statement on so many different levels. First of all, Vladimir Putin does only things that are in Russia's national interest. So for him to be endorsing Mr. Trump, that's because he thinks it's in Russia's national interest for Mr. Trump to be the leader in the United States. Second, you didn't play it in your clip, but the part I found most reprehensible when responding to that question on Morning Joe was the moral equivalency between what the United States does abroad in terms of our armed forces and what Putin does domestically. Trump basically said that what soldiers in Afghanistan are doing and pilots in Syria are doing is the same thing as those that kill journalists in Russia. That is not in America's national interest. Now, both of you have served in this administration. Wendy Sherman, you served in the prior one as well. Chuck Hagel, the former Defense Secretary, had some sharp criticism in Foreign Policy Magazine of this administration, saying in a piece headline, "The White House tried to ‘destroy’ me." "Whether it was the right decision or not," and here he's referring to the decision not to go against Assad after Assad had crossed the red line that President Obama announced on the use of chemical weapons. "Whether it was the right decision or not, history will determine, but there's no question in my mind that it hurt the credibility of the president's word when this occurred. A president's word is a big thing. And when the president says things, that's a big deal." Did the president hurt his leverage overseas, especially in the Persian Gulf with Arab leaders, by not using force against Assad back in 2013? --was to get chemical weapons out of Syria, which was very critical. Because if we had the situation now where Assad had chemical weapons we would have an even more dire circumstance. But I think the point today, Andrea, is that we have to be, as actually Secretary Clinton has said about resolve, not about fear. That's what America's about. And the president and, quite frankly, the Democratic candidates, have talked about a multi-pronged strategy. Not just slogans. Slogans are not a strategy. But a multi-pronged strategy that not only defeats ISIL but stops recruitment, stops financing of ISIL. Make sure that we take care of this not only for the immediate, but for the long-term as well. And that's what we have to be focused on. America matters in the world. Our leadership matters in the world. And we see that every single day. But, Mike McFaul, ISIS or ISIL is spreading. They're now, in fact, putting down roots in Kenya and Nigeria. In Afghanistan. Spreading their message of hate and terror, even though they may be losing some ground short-term Iraq and in Syria. So what is the solution to this? The solution is a multi-pronged long-term strategy, as Wendy just alluded to. And it's not going to be easy. It's not going to be a slogan. I do think the administration has undersold its policy, as the president hinted at a couple weeks ago. I just want to remind your viewers, when I hear candidates say, "The United States is doing nothing to fight ISIS," there have actually been 9,000 attacks against ISIS in Iraq and Syria. We've spent over $5 billion already in that theater alone. But nobody believes that there's going to be a victory over ISIS through an air campaign. And that's why we need to have the multi-pronged strategy, including our Muslim allies. Because at the end of the day it's going to be Muslim soldiers in Iraq and in Syria that are going to ultimately defeat ISIS. It won't be the United States alone. Mike McFaul, Wendy Sherman, thank you both so much. We have to leave it there. And happy holidays, happy New Year to you both. And coming up next, Spike Lee on his controversial movie, Chi-Raq, and the conversations he wants his film to inspire. I want people to think about guns. That's the takeaway from this film. And welcome back. The holiday season gives us many reasons to celebrate, but we also want to take a moment to reflect and to remember those in political life and the media who we've lost this past year. Are you aware of any devices that were installed in the Executive Office building of the President? This nation is more a tale of two cities, than it is just a shining city on a hill. There’s a big war going on in Vietnam and the people in Panjang Province know all about it. SARAH BRADY:All it took was one gun, one bullet, and one man who should never have owned a gun. The right to free speech, the right to dissent, the right to voice an opinion may be unpopular, but I think a second and equally important issue is the right of people in this case my constituents, to be represented by someone they chose. Well, it ain’t over til it’s over. So I have something to ask of you. Be there for my dad like he was for me. The warning bell he is trying to ring is one about guns in America. And while Pew Research Center says gun violence has declined since the 1990s, the backdrop to the senseless violence depicted in Lee’s film is the city of Chicago, where according to The Chicago Tribune, there have been almost 3,000 shooting victims this year alone. Including a police sghooting that left two people dead Saturday morning. But it’s not just police shootings that Spike Lee wanted to draw attention to when he sat down with Chuck to talk about his movie. Who's the audience for this movie? I say everybody. You know why? Because I get asked many times, I've been making films since 1986. And we do press for the film, the one question that the filmmaker’s always going to get is, "What is the take-- what is the takeaway? What do you want people thinking come out of the theater?" Usually I say I'm not answering that question. You just took one of my questions. --I don't answer that question. But I'm jettisoned for this film. I want people to think about guns. That's the takeaway for this film. Eighty-eight Americans die every day due to gun violence. That adds up to 32,000 per year. And that is not just the hood. It's not just Chi-raq. It's not just Killadelphia, or where I'm from Bucktown Brooklyn, New York or the Bronx or the South Side, or excuse me, south central L.A. It affects rural areas. It affects everybody. --I disagree. I think that guns-- what'd I just say? Guns affect everybody-- and not just in the hood. --go so far as to say that, but I do think that I want to speak in this film upon black on black violence that it's not always policemen. You know, it wasn't a cop who killed, that executed Tyshawn Lee, the nine-year-old boy who was lured into the alleyway in Chicago, South Side. So I think that. to me I don't-- the complexion, the color or the trigger finger, the trigger finger does not matter to me. If you killed somebody, you killed somebody, no matter who you are. --I know what you're talking about. --all of these-- right. These-- these areas are not what they were 25 years ago. Yet here we are with Chicago. What did you-- you say you still can't figure it out. Why? Everybody asks. I mean, no one has one answer. You know, the spiritual advisor of this film is the great Michael Pfleger. He can't give me a definitive answer. And I mean, I think-- I think part of it has to do with-- Chicago is America's biggest segregated city. And I think that has to do a lot with it. And people are just thrown to one side in town and left to their own devices. Just by calling it Chi-raq, you're saying it's a war zone. Did you feel like it was a war zone when you were walking these neighborhoods? No. Because the police were around us. But my first day of pre-production, one of my-- I had to go to a funeral because one of my guys got shot down and murdered. The first day of pre-production I was at a funeral. And while we were filming, I said to this boy, "Excuse me, it's redundant. People heard me talk on this film.” June 1st was the first day of filming, July 9th was the last day. During that time, 331 people got wounded and shot. Sixty-five got murdered from June 1st to July 9th. And it's escalated since then. Why do you think there isn't this sense of outrage about what's happening in Chicago? Are we numb? Is it us in the media? Is it politicians? Who is it? I mean, Obama said it himself. You know, people are numb. He's tired of giving these speeches after every mass shootings. And that's why I said the takeaway I hope people take away from this film is guns. I heard you answer a question about the Black Lives Matter movement. And it was interesting what you had to say. It was you were talking about it, talking about its success. And then you were, like, but-- and there seemed to be-- I didn't know if you were critiquing on a generational grounds. What would be your advice to the Black Lives Matter movement? Can't do it. I'm not saying they're doing it. I'm saying I can't do it. What about President Obama? Here's a guy who lived in the South Side of Chicago, calls himself the South Side. What a lot of his conservative critics, whenever he would speak out about a mass shooting, they come back with, "What about Chicago? What about Chicago?" Is there a role he can play in this? And if so, what is it? You know what? You gotta ask him that next time. Would you like him to play more of a role in this? 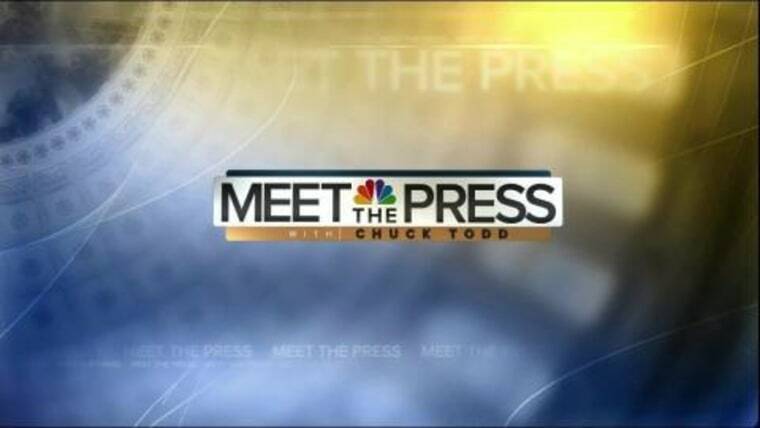 And you can see a longer version of Chuck’s interview on our website, MeetThePressNBC.com. And don’t go anywhere because we’ll be back in less than a minute with End Game, and the panel will look ahead to 2016 and the one question dominating the Republican contest, will anyone stop Donald Trump? And it's End Game time and the panel is here to look ahead to the political year ahead. We'll start with that man again, Donald Trump. Michael Gerson, who's going to stop him? Well, I think there are two big questions right now that Republicans are asking. One of them is do Donald Trump's poll numbers translate into actual voters and caucus goers. Exactly. His voters traditionally don't vote very well. The other question is who will occupy the establishment lane in this election, because that's the one that's produced that candidates recently here. But right now there are at least four candidates who are contending for that. Marco Rubio and Christie and Bush and Kasich, three of those are doing fairly well in New Hampshire. The establishment needs one person to unite and solidify this kind of support if they're going to make a run against Cruz and Trump. And Chris Christie is really showing strength by sticking to New Hampshire. And he is really blocking Rubio from gaining any traction up there. I would argue two things. One, on the establishment front fundamentally the establishment candidate isn't going to win if they label themselves the establishment. Not in this environment where 60 percent of voters right now on the Republican side say, "We don't want somebody who's been part of Washington." So whoever that person is going to be does not want the kiss of the establishment. Chris Christie I think is doing a very good job in New Hampshire. It feels very much like to me like we saw with John McCain in 2000 where he just settled into that state. He figured out how to do New Hampshire very well. My question for Chris Christie is where does he go after New Hampshire? South Carolina's not a natural place for him. Nevada's not a natural place. The South's not a natural place. It does complicate things, certainly, for the Marco Rubios and others who are trying to be the non-Trump, non-Cruz candidate. And with the economy receding as the number one issue, Helene, you cover the Pentagon, counter-terror is of course top of mind. And we've seen with Bernie Sanders today and with the other candidates that they aren't really able to frame responses to this. No, not if you go anywhere lower than the surface. So I think you'll continue to hear a lot of the same sort of rhetoric we've been hearing. "The administration hasn't been strong enough. We need to stand tough." I hope Ted Cruz is not going to continue his thing about carpet bombing Syria. I think on foreign policy in particular I will be looking to see these guys actually come up-- these men and women. It's nice to be able to say that. Actually come up with some specific policy recommendations for exactly how they think they can get this coalition that's fighting the Islamic State, to make real progress. And how they're going to get these Arab countries to invest more skin and put a little bit more skin in the game, particularly on the ground in Syria. Well, is Hillary Clinton vulnerable herself, especially in a general election if she becomes the nominee, because of this whole issue of regime change? Of what happened in Libya after the collapse. What happened in Egypt. Does she have to carry the weight of some of the failed Obama policies on her shoulders? I think she absolutely does, but I think from what I've seen so far I think if she cannot articulate her foreign policy stance after four years as secretary of State, then maybe she shouldn't be president. I don't really worry about her there. Well, with all of this doom and gloom and the terror attacks, let's at least think that there have been a few funny things that have happened along the campaign trail. Let's watch. I own one pair of underwear. That's it. Some of these billionaires, they got three, four pairs. Yes, last week I bought my second pair of underwear. That's a joke. So who do you want as president? One of these Washington insiders or a guy who has one pair of clean underwear that he dries on a radiator? Well, which is Bernie Sanders and which is Larry David? I can't get them straight. I actually think, just judging from my kids and the videos they're watching, I think Larry David did more for Bernie Sanders in humanizing him and making him a sort of fully fledged, breathing figure in politics than he's done for himself. But Marco Rubio throwing the football just tells us, and of course the American eagle in Donald Trump's hair, that be wary of the photo op that can go terribly wrong. Yes. And the best part about this campaign is none of us could have made half of this up. If you had just told us, any of us, where we would be at the end of 2015, not believable. Well, and I think we'll be in a different place. In 60 days we'll be in a very different place than where we are right now. Three weeks from now. I mean I'm ready for this thing to start. And things do break late in these. You have to understand, national polling doesn't matter. State polling matters, but things break late. But what we saw of course last time is with Hillary Clinton versus Obama in New Hampshire, that it all broke in the last 48 hours. Yes. After how many years now have we been covering this campaign? It feels like four. I am so ready for actual voting to begin, because I'm really curious about just whether these people who've been polled are going to show up. Exactly. Well, we will leave it there. Lots of excitement to come. Thank you all for a great panel. That's all for today. Have a very happy New Year. Chuck will be back next week. If it's Sunday, it's Meet The Press.